the egg shapes have to have special bees on them - not looking forward to making them, though if they turn out properly, they look fabulous. Fingers crossed blogger is working again properly for me to reply to comments. I very nearly moved my blog to WordPress over this. Wishing you all a fabulous week, where ever you are and whatever you are doing. Not much in the way of flowers in my winter garden at present - however these little cyclamen always appear and always charm me. Gosh this book was a wonderful read. Very topical as it is about a mass shooting in an American school, but told from a child's perspective as to how he and his family deal with the aftermath. Have tissues handy though. More sewing - this time a dolman top in a lovely merino. I made the medium. As the pattern had short sleeves I had to draft longer ones, however, because I made them slightly too narrow I wasn't able to cuff them as they wouldn't fit over the arm of my machine. I want to make this again, so next time will widen the sleeves slightly and decrease the neck line. Free Pattern from Cation Designs. I took Miss B and Mr J to see the Bodyworlds Vital exhibition currently showing in Auckland. Well worth a visit, we all learnt a lot. I'm off to go and sit in front off the fire now, with a pile of new magazines which turned up in the post today. Hello all, welcome to another week. It is with sad hearts that after much deliberation and discussion, Linda @Kokaquilts and I have decided to stop hosting Sew, Stitch, Snap, Share, our fortnightly linky party. Lifestyle changes, time constraints, and a drop in numbers linking up have all contributed towards this decision. Over the past year we have been hosting this, we have been continually amazed and inspired by the creative quilters and stitchers who have linked up each fortnight, and would like to thank you all for sharing your work with us and other readers. I am still going to keep blogging, there is something to be said for sitting at my computer, with a hot cup of tea or glass of wine (dependent on the time of day) and reading through my list of favourite blogs. I liken them to online magazine articles, always lots of lovely photos, little personal anecdotes and more details on beautiful creations and the stories behind them than Instagram has to offer. I think you get to know the writer through blogs. In saying that, I can now be found on Instagram @julielou41 too, however more detailed info on any quilty/sewing type photos is always on the blog. Again, thank you all for supporting Linda and I with Sew, Stitch, Snap, SHARE, over the past year. 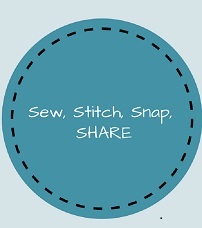 Welcome to another Sew, Stitch, Snap, SHARE. Winter has well and truly hit New Zealand now, so I am finding it quite pleasant to snuggle under Miss B's Sea Glass Sampler quilt and slowly stitch away in the evenings. I guess it all works towards a finish and a really special quilt, but it feels like quite a daunting task ahead of me still. Even though it's not all quilted, it is at a point where I can probably bind it, which would make it slightly less unwieldy to handle and stop the raw edges from fraying more due to all the handling. Lately Auckland Libraries have been getting lots of new quilting and sewing books in, I regularly peruse the online catalogue and request ones I am interested in before committing to buying them. It feels like Christmas some mornings, when I arrive at work to a lovely pile of requests that have arrived for me. These books have been interesting browsing , I am particularly liking Flossie Teacakes English Paper Piecing book, and feel that this may need to be added to my collection. Last September/October I joined the #AMHSewalong hosted by Isabel and Monique on Instagram. The idea being to actually use our precious Anna Maria Horner stashes and sew a quilt, of whatever pattern we liked. I decided that this was a fabulous idea, and trawled the internet and favourites on my Flickr and Pinterest pages, looking for inspiration. I had always had in my mind that I was going to do an Irish Chain quilt using my precious stash, but could never bring myself to cut into the fabrics for it. Coming across this picture on my Flickr Faves - I knew I had found what I wanted to make. It's simple, bright, and with the blocks set on point, just a little different. Fast forward to this May this year, and the quilt and pieced AMH baking I had made, are still sitting, untouched, in my WIP pile (which I have to admit has been stressing me somewhat.). Normally I try to quilt all my quilts myself, whether basic straight lines on my machine or hand quilting, but with the lack of time I seem to have these days, I made the decision to send it to my friend Leeanne of Quiltmekiwi, for quilting. Best decision ever. I asked for an allover design, but something that would still let the quilt be soft and drapeable. I asked Leeanne to provide the batting which is a wool/polyester blend and she quilted it with a lovely camellia design, which echos a lot of the lovely AMH florals. It has now arrived back home, and after a frenzied weekend of making and attaching the binding, which is Kona berry colourway, I now have a new quilt snuggle under on cool winter evenings with a book or hand sewing. This one is strictly mine, unless Meeka decides to join me.